Force Google to reveal the most relevant words for your content and links for a ranking boost. Ignoring LSI Architecture drops your rankings, regardless of how many backlinks you have. Know exactly how to increase the relevance for any page on your site. Boost rank and get traffic. Reveal your clear SEO blueprint, so you know exactly what to do next, unlike your competitors. Google already has the "relevance code" for every keyword. You just need to see it. Since it's no secret that Google ranks pages in order of relevance, the key to SEO has always been to figure out how to make your site more relevant. Once KeywordMap Pro reveals Google's "relevance code" for any keyword, you can easily put together sites and content that are instantly relevant to Google through simple reverse engineering. This results in an increase boost in all the other SEO ranking factors and will force your page to the top of the search results faster. Any marketing strategy that doesn't include traffic from Google has a big hole. KeywordMap Pro gets the mapping data directly from Google. Get traffic. Once your rank in the Top 3 in Google, you get 70% (of their 70% market share) of all clicks. KeywordMap Pro tells you how to get there...now. Google ranks sites in order of relevance. How they perceive your relevance is how they rank your site. KeywordMap Pro uses Google data to increase relevance and push you to the Top of the results. Once KeywordMap Pro shows you what terms Google says are most relevant for your profitable keyword, you simply add those terms to your site, content, and linking structure. Then watch what happens next as Google sees you site as most relevant and ranks you right at the top. Google already has the "relevance code" in their ranking algorithm for every keyword. You just need to see it for yourself. KeywordMap Pro shows you this ranking info in a visual way, so you can put it to work instantly for your most profitable keywords and converting pages. Google blocked access to the WonderWheel on July 3rd, 2011...or so everybody thought. KeywordMap Pro grabs this LSI data and maps it for you. Unlike WonderWheel, you can go as many levels deep as you wish. You can also see all the relationships between words clearly too. KeywordMap Pro couldn't be any simpler to use. The application does all the hard work for you. Just put in the keyword you want to rank for and click "Graph It". All KeywordMap Pro data comes directly from Google. The application then maps the relevancy data for you so you can visually see how Google understands any keyword, and boost your rankings. Since Google has relevance data in every market, KeywordMap Pro can map this data. Just place in your keyword and drill as many levels deep as you wish to see all the relationships and relevance data. You'll have the ability to select country specific Google datacenters, custom languages, and work through your own network connection. just let us know anytime in the next 60 days for a prompt, full refund. "I have to say that this is way under priced. The value that you receive is phenomenal and the training alone is worth the price. I just wish he wasn't sharing this with anybody else. This is definitely a quality product and I want to say thanks for making this available." "I always buy ALL of your stuff as soon as it comes out! I snatched this up without even reading your ad copy! You always over-deliver and produce only top-knotch products. This new product is yet another quality software app from you and it works so well, I feel like I "won the Golden Ticket!" Thanks for all your hard work!" "I immediately bought this when you sent the offer. After trying for a few hours, I only have this to say: It is WonderWheel Reincarnated. To all others, it is a steal buy with the software (KeywordMap Pro) and bonus software of UCAP (ultimate Content Analyzer Pro) and other bonus videos and guides, all very useful for serious internet marketers. What the heck, go buy it now..."
"I'm 100% confident that every webmaster should own this. If you're bothering to build a website at all, you need to consider LSI as part of your work. Though LSI should be a natural part of everything you write (or have written) for your website, people -- including me -- can't always think like Google does. It's easy to overlook important phrases. In addition, as a writer, I sometimes run out of things to talk about in my articles. A tool like this -- desperately needed since Wonderwheel (tm) vanished -- is a gold mine. And, this software isn't just for webmasters. LSI works at Amazon, too." You also get this powerful tool for engineering hyper relevant content. UCAPro™ is the perfect tool to analyze your content for relevancy, and shows you exactly what words are missing. KeywordMap Pro™ Software -- Reveals powerful Google LSI ranking data, so you visually see keyword relevance. Use it for an unlimited number of projects and keywords. Works in SEO, PPC, keyword research, linking strategies, domain research, content mastery, market research, or any other marketing activity that requires you to understand your theme relevance. 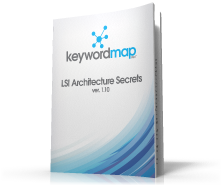 You get access to the exclusive KeywordMap Pro Member's Area where you'll find 3 LSI Guides (LSI Architecture Secrets, LSI Content Mastery, LSI Linking Strategies) and 4 Bonus Videos that cover the material in the guides. Watch over our shoulder as we show you how to get the most out of KeywordMap Pro and The Ultimate Content Analyzer Pro. You'll learn how to engineer a site that ranks, how to write content that gets clicked, and how to improve your relevancy to increase your rank. Ultimate Content Analyzer Pro will show you your content relevance visually. Just input the term you want to rank for in the search engines and put in the LSI terms you received from KeywordMap Pro. UCAPro will then mark up your content and give you an LSI relevance score as well as tell you which terms are missing in your content, so you can work those in naturally for a relevance and ranking boost. In Video #1, You'll see how to make your site hyper-relevant using LSI Architecture. In Video #2, see how to create top ranking content using KeywordMap Pro and UCAPro. In Video #3, see how to setup your link structure, and visualize your "Ranking Roadmap". In Video #4 I'll show you the exact steps you to find great domains easily. So, what's all this going to cost...? KeywordMap Pro is so affordable, you can profit from it right away. You're gettting the software application, 3 Bonus Guides, 4 Bonus Videos, and access to the Ultimate Content Analyzer web app for one payment of $47 today.